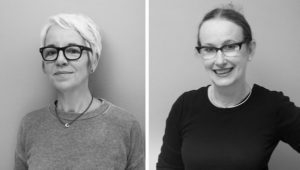 Latham and Neve has been in the forefront of British Designer jewellery for over twenty years since Anna and Helen met at Medway College of Art and Design, the most promising students in their year. Their design philosophy is Modernist but wearable, cool but comfortable; the finish is exact and every piece is made to be easy to put on and to remove, to avoid snagging and catching, and to look quietly and elegantly fabulous. It’s all created in their workshops in the Garden of England since they both moved out of London’s exciting East End at the beginning of the decade. Everything is handmade and British hall-marked. They work in silver and 18ct gold, and their collections are unique and singular, although they are happy to discuss bespoke pieces.